When it comes to its handling of issues affecting the ordinary man, the coalition Government has demonstrated its lack of empathy and a heavy-handed approach to those in most need of consideration. He said this was necessary especially if you were licensing it before and for years they have been working this way, as he explained that “people have livelihoods” and they have to maintain their families. Acting Traffic Chief Ramesh Ashram had stated that this campaign is currently ongoing until all vehicles are in compliance with the traffic rules which prevent them [bus drivers] from operating with coloured wraps. He noted that these colours are most times in breach of the vehicle’s registration which states clearly that the vehicle – when registered – is in one or another colour. Ashram explained that had the colours been adjusted on the registration – in accordance to law – then there would be no need to impound the vehicles. Jagdeo informed the media that he met with a group of protesting mini-bus operators at the Square of the Revolution, in Georgetown, on Thursday and they asked him to intervene and provide representation on their behalf. However, the Opposition Member of Parliament said he had not taken a side as he needed to brief himself on the law in this regard. Nevertheless, he is of the opinion that even if the law is on the side of the authorities, time should be granted for the minibus operators to comply. He compared this situation to one which occurred under his tenure when taxis were to be changed to the colour yellow. “I met with the people…, told them the paint and so would be duty-free, to transition,” he said. It has since been reported that having received heavy criticism over the past two days of the handling of these operators, the Guyana Police Force will cease the clamp down until a meeting with minibus owners/drivers is held. Jagdeo also called on Government to improve the quality of medical services it is offering Guyanese. He expressed concern over the continued mismanagement of the public health system and the shortage of basic medical supplies at various institutions across the country. 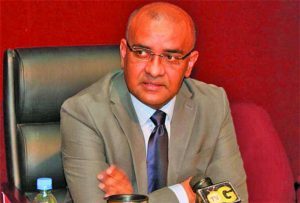 According to Jagdeo, the Government is not serious about the nation’s health and providing affordable and high-quality healthcare. He said citizens are complaining – in Region Three (Essequibo Islands-West Demerara) and communities in Region Nine (Upper Takutu-Upper Essequibo) and other far flung areas – about the challenges they are facing. Jagdeo noted that the plight of the hard-working and poor Guyanese is being ignored. “There is a shortage of basic drugs. The public health system is not responsive,” he insisted as he explained that given the unfortunate state of economic affairs which are prevailing, people are unable to afford the medication they need independently. He reminded that the 14 per cent tax on pharmaceuticals introduced by the Government has resulted in additional hardships being experienced. The former President also lamented the fact that even doctors and nurses are complaining about the sad state of affairs. According to Jagdeo, Government needs to start listening to the people, especially elders, who have been experiencing immense difficulties accessing drugs and medications via the public health system. Additionally, Member of Parliament Charandass Persaud also came in for some flak from the Opposition Leader, over his comments that sugar workers who cannot afford to send their children to school should face the brunt of the law. Instead, Jagdeo urged that help be extended to these workers. Slamming Charandass for his “stupid” comment regarding these sugar workers not sending their children to school, Jagdeo pointed out that parents can no longer fall back on the uniform voucher offered under the PPP Government.